On a recent evening in a Columbia City coffee shop situated a stone’s throw from $800,000 condos, the conversation of May Nguyen and her husband, Jon Lee, turned toward something a lot of Seattle residents are talking about now: the skyrocketing cost of rent. Last summer, Seattle-based Zillow—the real estate database giant—released a statistical report that stunned Seattle’s renters, who slightly outnumber Seattle homeowners. The average monthly rent in the Seattle metropolitan area inched past $2,000 per month for the first time, an increase of more than $450 per month from five years ago, and more than $170 per month from just two years ago. What’s more, the average cost of rent was up 9.7 percent between spring 2015 and spring 2016—a percentage increase four times the national average. If you are a renter, here’s some cold comfort: At least Seattle is less expensive than the Bay Area, Los Angeles, New York City, San Diego, Boston and the nation’s capital. That rising rent buys less and less: In August, the real estate blog Curbed Seattle reported that $2,000 per month bought 529 square feet in South Lake Union; 618 square feet in Belltown; 696 square feet on First Hill; 575 square feet in Ballard; and 694 square feet on Capitol Hill. Rent inflation may not be a big issue for workers coming here for high-salaried jobs in the tech industry. But it’s taking a toll on many others like Nguyen and Lee, a well-educated couple with steady jobs who want to stay in Seattle. Many economists say housing expense should account for no more than one-third of your overall income. If the average Seattle rent is $2,000 per month, that means an income of $72,000 is needed to afford an apartment in Seattle. Who earns that much? Not social workers, administrative assistants, teachers, waiters, cooks, sales reps or maintenance workers (or many others)—who earn average salaries between $28,000 and $45,000, according to figures from King County. All of them are at serious risk of being priced out of the city. 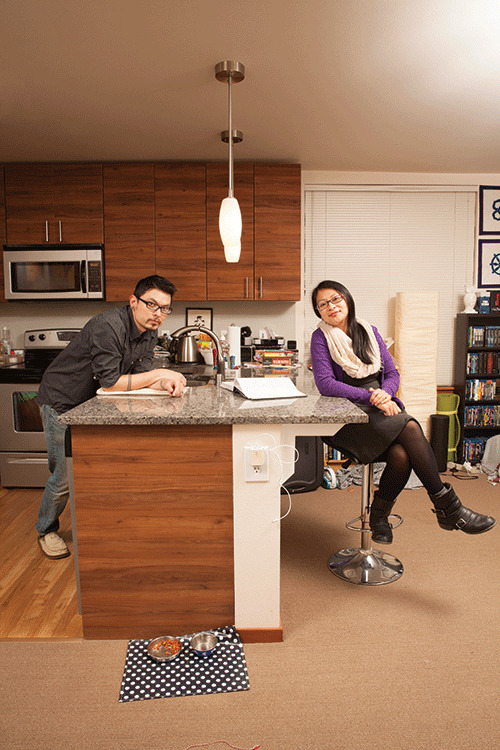 Nguyen, 35, and Lee, 34, live in a 700-square-foot apartment at The Station at Othello Park, a six-story, 351-unit building that opened in 2011 across the street from a Sound Transit Link light rail station—one stop south of Columbia City, and like it, undergoing inexorable gentrification. Nguyen, who has a degree in marine biology, is programs manager at the Rainier Arts Center. Lee, who attended the film school at a community college, works in an administrative job at a downtown Seattle law firm. They’ve both received small wage increases over the past couple of years, but not enough to keep pace with increases in rent and cost of living. While they consider themselves fortunate to be well educated with full-time jobs, they spend about 40 percent of their income on rent, live paycheck to paycheck, are uncertain about starting a family and have no room in their budget for savings. The reasons for seattle’s high rental prices might seem obvious. A booming economy and not enough inventory, right? Zillow chief economist Svenja Gudell, who has tracked the local market for a long time, notes that it’s a little more complicated than that. Newcomers to the city—and our healthy economy is attracting a lot of them, an estimated 120,000 by 2035—are choosing to rent rather than buy as they get to know the area. And overall, Seattle residents are relatively young and untethered. “The need to actually be a homeowner comes later on in life, and that contributes to a bunch of people in the rental pool,” says Gudell. Those renters who do want to buy a home are finding the market expensive and competitive. “It’s a situation where you have five available homes and 20 people wanting to buy those homes,” says Gudell. “It turns out that, literally, people take years to find a house.” The result? The normal rotation from renter to homebuyer slows down, the number of renters increases, and the demand for rental housing soars. The increase in rental prices is also making it more difficult for middle-income renters who want to enter the housing market to put money aside for a down payment. “That piggy bank that you have in the corner of your living room that’s supposed to collect money for your down payment is slowly but surely being emptied every month because you have to pay more in rent,” says Gudell. Some Seattle renters may also be coming to terms with paying more money for smaller apartments just to keep a foot in the city. It’s a strategy adopted by renters in other high-demand cities. San Francisco’s median studio rent is $2,908—two bedrooms will cost you $6,033; artist Peter Berkowitz became famous last spring when he rented a plywood box in a friend’s apartment for $400 a month. In Manhattan (median rent, $3,339), a few lucky renters snapped up 265-square-foot micro apartments for $2,570 a month. Seattle renters have also turned to microhousing: 100- to 200-square-foot single rooms with kitchenettes that rent from $500 to $1,000 per month. Alison Driver, 31, is one of the Seattleites who may soon consider one of Gudell’s strategies for more affordable rent: moving farther from the city center. Much farther. Since the summer of 2015, she and her boyfriend, James, have lived with their two dogs in a 650-square-foot apartment within walking distance to the heart of Fremont. She works at a nonprofit in downtown Seattle. James is a scientist. Both work full-time. They paid just under $2,000 per month in rent. That changed in August when they e-mailed their landlord to see about renewing their lease. “We debated whether we should ask if the rent is going up,” says Driver, during an interview at a coffee shop in downtown Seattle. Across the street, building contractors in bright safety vests were busy working on a construction site while cranes slowly pivoted overhead; construction was underway on a 40-story, 398-unit luxury apartment building. “Our landlord wrote back and said, ‘Yeah, you can sign a new lease. Here’s your new rent.” The increase? Nearly 10 percent. Driver considers herself a true Seattleite. She grew up in the View Ridge neighborhood, attended Seattle public schools and returned to the city in 2011 after college and a stint in the Peace Corps. She recently earned a master’s degree in public administration at the University of Washington. She enjoys biking, rock-climbing, swimming and being close to her family. She’s also built a strong professional network in the city. But she’s considered moving to Tacoma, where housing is more affordable and the city less congested. A lot has changed in the five years since she returned to Seattle. Then, she and a roommate split a two-bedroom Phinney Ridge apartment for $1,175. “At one point, they raised the rent $100 after we had been there two years. We were incensed!” she recalls, laughing.